Andrew Lownie Literary Agency :: Book :: At Risk: An innocent boy. A sinister secret. Is there no one to save him from danger? Adam is a fragile and anxious boy whose relationship with his mother starts to unravel. His mother is seen as ‘wonderful’ and ‘devoted’ to Adam who she works hard for, but all isn’t as it seems. Eleven year old Adam is taken in by Casey, following his mother’s car accident which left her with a broken pelvis. Casey is told that Adam is not in the best of health and he attends regular medical appointments for an unknown ‘sickness', but isn’t fazed. Casey takes Adam in, believing all will be well and back to normal, reassuring him as well as herself. Every evening Adam visits his mother and Casey gives them ‘private time’ respecting his and his mother’s time to be alone. Soon enough a pattern begins to emerge as Adam’s health continuously deteriorates after every visit. 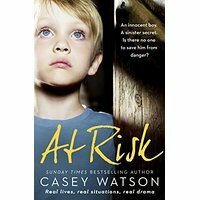 The level of distress worries Casey who ends up stumbling across the real relationship Adam has with his mother, and Casey finds it’s more sinister than she had known.